Hilarious Comedian from India - Kanan Gill // Live in Singapore 2019! No admission for infant in arms & children below 6 years old. Children 6 years and above must purchase a ticket for entry. 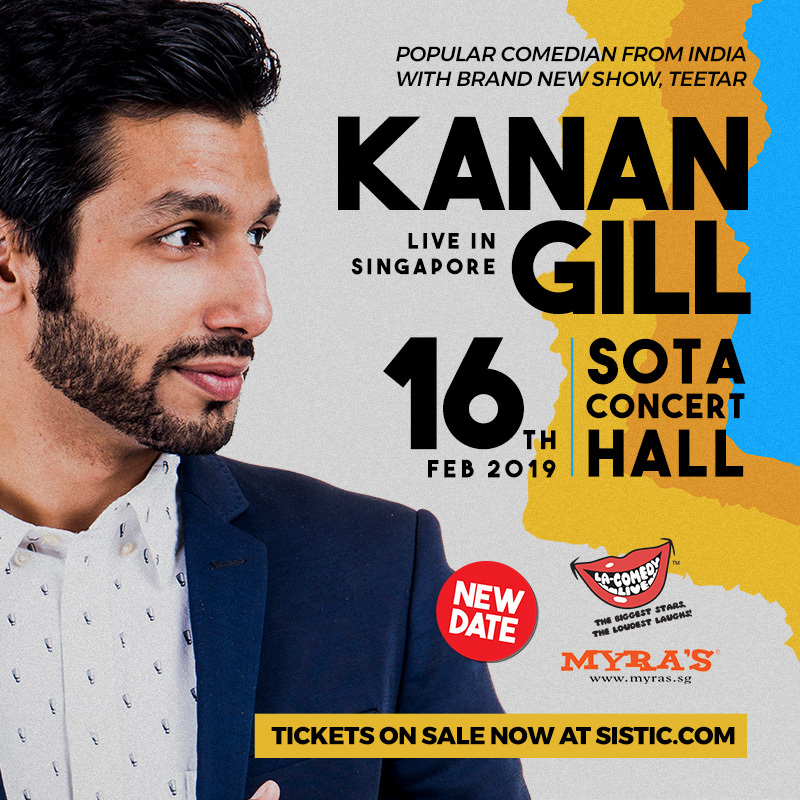 LA Comedy Live is excited to announce that one of India's most popular comedians, KANAN GILL, will be making his anticipated return to Singapore on Feb 16, 2019, at SOTA Concert Hall! Kanan Gill's latest special, 'Teetar' is a personal, observational and deeply stupid follow up to 2017's Keep It Real. In this hilarious one hour show he juggles ideas from Julius Caesar's death to marching to bands and his building societies. The show also explain what "teetar" means. Kanan Gill is an Indian stand-up comedian and YouTuber who rose to fame with the YouTube series, 'Pretentious Movie Reviews' where he reviews flawed yesteryear Bollywood films in a hilarious manner. His partner-in-comedy in running this widely popular series is his fellow stand-up comedian Biswa Kalyan Rath. The duo has stirred up a storm in the YouTube scenario in the Indian subcontinent with their over-the-top commentaries and super-funny personalities. A software engineer by profession, Gill has found unbelievable fame in a totally unrelated field. As of today, he has quit his engineering job to focus fully on his career as a comedian, and divides his work between online and offline gigs. As of May 2017, this hugely popular comic star had over 502k subscribers on his YouTube channel 'Ok! Gill,' 343k followers on his Instagram account and 819k followers on Twitter. During his early days as a comedian, Kanan Gill came across another budding comedian, Biswa Kalyan Rath. The duo teamed up and originated the YouTube series 'Pretentious Movie Reviews' where they review Bollywood films in their own funny and twisted ways. The reviewed some popular movies such as 'Gunda,' 'Hum Saath Saath Hain', 'Prem Aggan', and 'Aap ka Suroor' which earned them a large fan following in movie-crazy India. Their rising popularity in India soon gained them international notice as well and Gill was given a chance to work in an improvised sketch comedy show, 'The Living Room,' on the American channel Comedy Central. He also co-hosted the YouTube FanFest India and was one of the main personalities behind the YouTube Comedy Hunt. Ambitious to achieve even more, Kanan Gill ventured into Bollywood films in 2017 with a minor role in the Sonakshi Sinha starrer 'Noor.' In 2018, he was also the judge on Comicstaan, a comedic reality tv show.